Audio Icons is a print and t-shirt project originally inspired by British hi-fi design and engineering of the 1970s and 1980s. Created by speaker designer, writer and musician Phil Ward, Audio Icons began with illustrations of six iconic amplifiers and nine iconic speakers but has now been joined by an illustration the Naim NBL, a speaker conceived and designed by Phil in the late 1990s. The illustrations that comprise Audio Icons were created through a variety of digital techniques and based on a combination of personal experience, photographic research and manufacturer’s data. The illustrations portray each product as accurately as possible, while at the same time capturing something of the creativity, engineering and enthusiasm that went into each one. The amplifiers and speakers illustrated on the first editions are as follows: Musical Fidelity A1, Sugden A48, Naim NAP250, Meridian 101B, Quad 405, Armstrong 621, Mission 770, Naim SBL, Mordaunt-Short Pageant II, KEF 104/2, Acoustic Energy AE1, Linn Isobarik, Celestion SL6, Gale GS401, Bowers & Wilkins DM110. The NBL edition illustrates a pair of speakers in two finishes with grilles fitted and removed. Audio Icons prints are made on high quality A3+ or A2+ fine art paper and are supplied rolled and ready for framing. Prints are numbered and signed. Audio Icons t-shirts are printed to order and can be had in a range of sizes and colours. 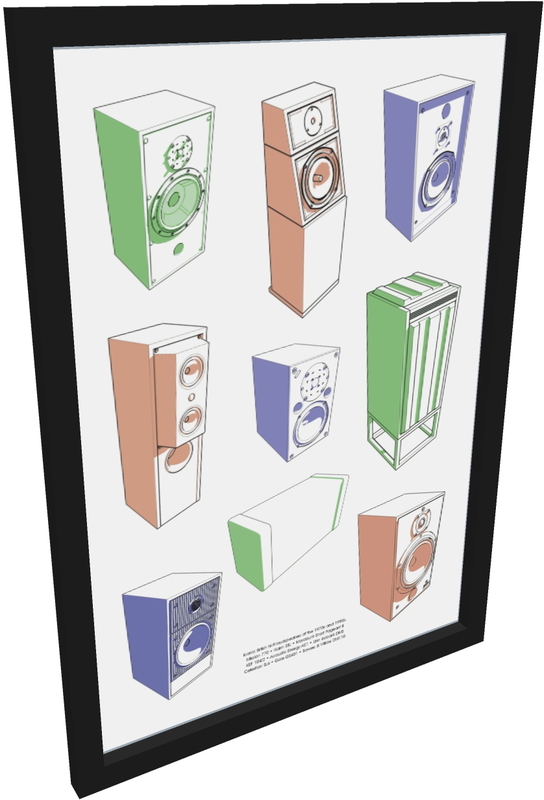 Each Audio Icons print image is available in t-shirt form. T-shirts are manufactured in high quality 100% cotton. They are unsigned and are available in unlimited numbers. Click on the images below for more information on prints and t-shirts.